NASA satellite data provided a look at Super Typhoon Haima in visible and infrared light to show the extent and strength of the storm. The Visible Infrared Imaging Radiometer Suite (VIIRS) instrument aboard the NASA-NOAA Suomi NPP satellite provided an infrared image of Haima on Oct. 18 and a visible image on Oct. 19. An infrared image of Super Typhoon Haima was taken on Oct. 18 at 12:40 p.m. EDT (1640 UTC) and showed that the coldest temperature around the eyewall was around 220 Kelvin (minus 63 degrees Fahrenheit / minus 53 degrees Celsius) indicating very powerful thunderstorms with the capability to generate very heavy rainfall. A visible image of Haima was taken on Oct. 19 at 1:35 a.m. EDT (05:35 UTC). 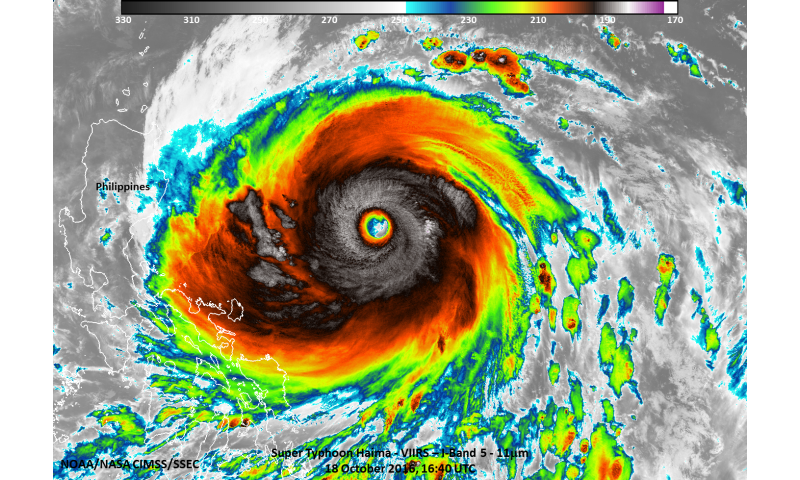 The VIIRS image showed that the Super Typhoon's cloud-filled eye was clearly visible. The eye was surrounded by thick bands of powerful thunderstorms. The Joint Typhoon Warning Center noted "Microwave imagery continues to show concentric eyewalls and an apparent eyewall replacement cycle. The eyewall replacement as well as interaction with land has contributed to the recent weakening trend." 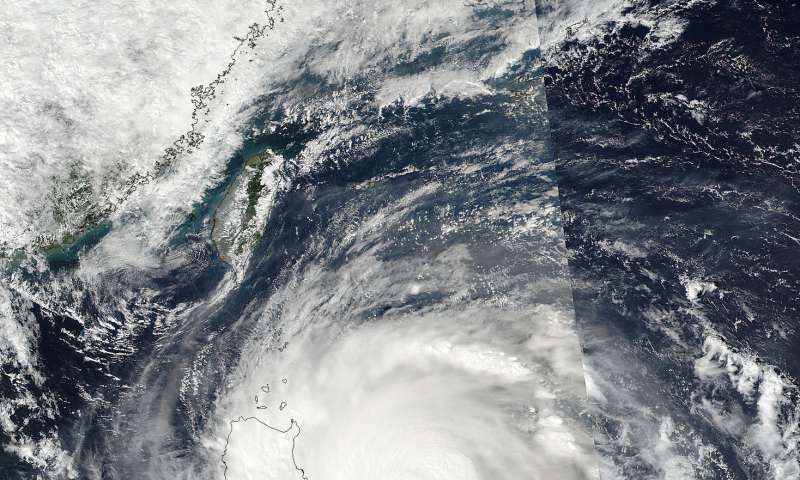 At 11 a.m. EDT (1500 UTC) Haima had weakened to typhoon status as maximum sustained winds were near 138 mph (120 knots/222 kph) making it a Category 4 hurricane on the Saffir-Simpson Wind Scale. Typhoon-force winds extended 60 miles from the center, while tropical storm force winds extended out 205 miles from the eye. It was located about 206 nautical miles northeast of Manila, Philippines near 17.3 degrees north latitude and 123.2 degrees east longitude. Haima was moving to the west-northwest at 18.4 mph (16 knots/29.6 kph). On Oct. 19 there are many warnings in the Philippines. They include: Public storm warning signal #5 in the Luzon provinces of Cagayan, Isabela, Kalinga, Apayao, Northern Abra and Ilocos Norte; Public storm warning signal #4 in the Luzon provinces of Rest of Abra, Ilocos Sur, Mt. Province, Ifugao and Calayan Group of Islands; Public storm warning signal #3 in the Luzon provinces of La Union, Benguet, Nueva Vizcaya, Quirino and Northern Aurora; Public storm warning signal #2 in the Luzon provinces of Batanes group of islands, Pangasinan, rest of Aurora, Tarlac, Nueva Ecija, Northern Zambales, and Northern Quezon including Polillo Islands; and Public storm warning signal #1 in the Luzon provinces of rest of Zambales, Bulacan, Bataan, Pampanga, Rizal, rest of Quezon, Cavite, Laguna, Batangas, Camarines Norte, Camarines Sur, Catanduanes, Albay and Metro Manila. Haima is weakening on approach to Luzon. The Joint Typhoon Warning Center forecast expects Haima to move across the northern part of Luzon and emerge into the South China Sea where it is expected to make a second landfall in mainland China, east of Hong Kong.